to inaugurations to presidential addresses, YouTube has brought you some of the biggest political moments in recent U.S. History. As President Trump begins his second year in office, YouTube is continuing this tradition. ,” “Bennie and the Jets,” “Tiny Dancer” -- changed what it meant to be a singer-songwriter, catapulted him to global mega stardom, soundtracked our childhoods, and changed lives along the way. Now after more than half a century on the road, Elton announced details of his final tour, “Farewell Yellow Brick Road” via an exclusive VR180 livestream on YouTube. Elton John is always up for doing things differently, using the latest technology to help him defy space and time, connecting his past and future. Last year, Elton's YouTube-supported “The Cut” gave undiscovered talent the chance to create the first-ever official music videos for three of his iconic hits, and now his final farewell tour announcement takes experimentation to the next level - livestreaming in VR. Check out VR360 video from the event at youtube.com/eltonjohn and additional event footage including two live performances, a Q&A with Anderson Cooper, and “Behind The Scenes” videos in VR180 tracking Elton's journey, supported by YouTube, will be available in the coming days. Elton John has entertained us, moved us, and had an unparalleled career that has redefined the cultural landscape. His unforgettable hits -- “Rocket Man,” “Bennie and the Jets,” “Tiny Dancer” -- changed what it meant to be a singer-songwriter, catapulted him to global mega stardom, soundtracked our childhoods, and changed lives along the way. Now after more than half a century on the road, Elton announced details of his final tour, “Farewell Yellow Brick Road” via an exclusive VR180 livestream on YouTube. from around the world, helping amplify their voices to counter hate and promote tolerance. Over the last year they’ve released dozens of thought-provoking videos that show the power of video to encourage empathy and understanding around the world. L-FRESH the LION, an Australian rapper of Sikh descent, who created a two-part track to challenge racism. Dina Tokio, a beauty vlogger from the U.K. who was recently named as one of Vogue’s “New Suffragettes,” uses her interview series #YourAverageMuslim to challenge perceptions about Muslim women including meeting with a hip-hop dancer, a powerlifter and a prison community development worker. Rosianna Rojas who, in partnership with the UN Refugee Agency, travelled to a remote part of Colombia to help refugees learn about the power of YouTube to document their stories and share them with the world. In 2017, global audiences viewed Creators for Change videos tens of millions of times, spending hundreds of thousands of hours watching this content. Creators for Change collaborated with social impact organizations and experts in Australia, Germany, Indonesia, Israel, Spain, Turkey, United Kingdom, France and Belgium. One example of this is the Indonesian chapter campaign #1Indonesia where YouTube creators Cameo Project teamed up with the Maarif Institute, a local NGO, on a cross-country project to encourage over 2,000 high school students from ten cities to create videos for positive change on topics that affect their communities. Topics included tolerance for ethnic and religious minorities, and digital literacy around online hoaxes. In 2018, we are continuing to invest in Creators for Change, including providing production and marketing support with a value of over $5M to diverse voices harnessing the power and scale of YouTube in groundbreaking, positive ways. We will engage more creators in the program, arm the wider YouTube community with new tools and education on how to create change, and empower more young people to use their voices to encourage positive social messages. In the coming months, we’ll announce the global recipients of the production grants we’re making available through this renewed investment. Video is a powerful medium to open minds to new perspectives and shared experiences. Creators prove that to us every single day. And we think Creators for Change in 2018 will reach and inspire even bigger audiences. 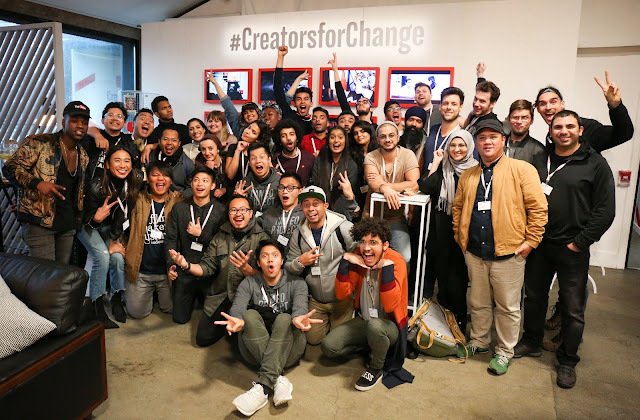 Since launching YouTube Creators for Change in September 2016, we’ve partnered with 39 inspiring creators from around the world, helping amplify their voices to counter hate and promote tolerance. Over the last year they’ve released dozens of thought-provoking videos that show the power of video to encourage empathy and understanding around the world. , lyric videos, covers, unplugged sets, live performances, backstage footage of your favorite artist and more. If you're currently subscribed to an unofficial artist channel, you will soon be subscribed to their Official Artist Channel and your subscription to any unofficial artist channels will become inactive. The Official Artist Channel is a single destination that gives you access to an artist’s full body of work, so you’ll now receive notifications solely from the Official Artist Channel whenever new videos are uploaded or when an artist wants to send a message to their fans.